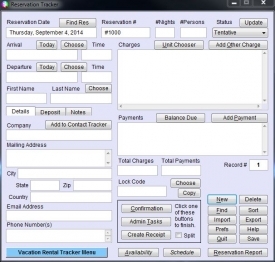 "Vacation Rental Tracker Plus is an ease of use property management system for motels, hotels, and more." 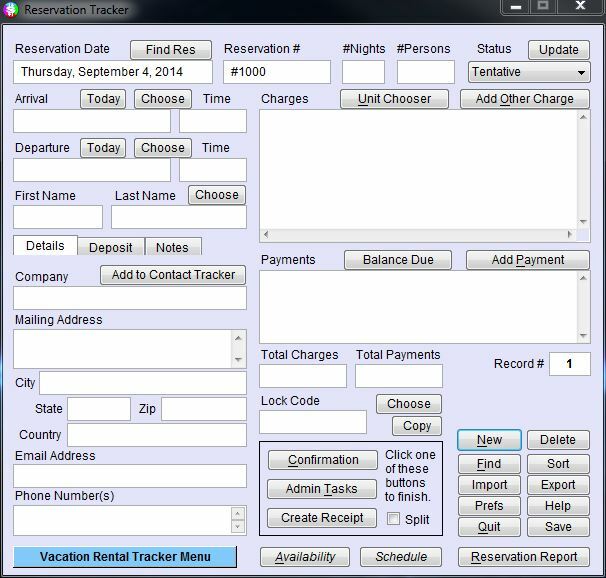 Vacation Rental Tracker Plus is an ease of use hospitality property management system for motels, hotels, and more. This reservation software will cover all of your customer tracking needs if you run a business such as a hotel, motels, or anything similar. You can keep track of billing and tenant information with relative ease. This simple to use application keeps your data organized when it comes to your finances and tenant information for your company. With Vacation Rental Tracker Plus for Windows, you have a small, simple to use window that gives you options to get your started. You can set a password to secure your information and backup or restore your records. Once you access your records you are good to go. Adding the information is pretty simple as well, as you can enter the information with saved defaults so you can enter the information quickly. As with many hotels and motels, you have a lot of tenants enter and exiting on a regular basis, so accessing your saved information quickly and easily is absolutely essential. With a reliable record keeping and simple to use application like Vacation Rental Tracker Plus you are well on your way with record keeping for your company. Easily organize all of your rental data, such as reservations, tasks, contracts, rent collections, and even appointments. Vacation Rental Tracker Plus helps you time manage your busy business on a number of tasks. Vacation Rental Tracker Plus allows you to accept credit card payments, which today is essential with most people walking around with just a credit card handy - sometimes cash isn't an option. Vacation Rental Tracker Plus also integrates with WebReserv, which is a very popular online booking service for hotels and motels. This can be very appealing to streamline the booking process for your company. You can then see the unit in question with all of the tenant's information, including financial information for recording payments. You can easily create tenant receipts, rent rolls, reservations, and many other reports that are necessary for the logging of information for your business. Make your business run a little bit easier by tracking all of your income and expenses with Vacation Rental Tracker Plus. Create account registers for an unlimited amount of accounts, as well as print check information on blank checks to increase the speed and convenience of your financial process.